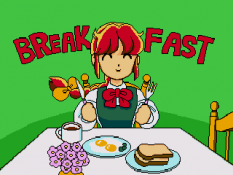 Welcome to -- RETRO GAME DAISUKI ! 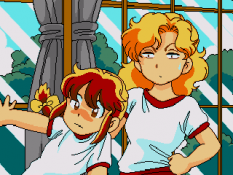 -- a blog about the wonderful world of Japanese retro video games (ARCADE / PC-88 / X68K / MEGA DRIVE / SATURN / PlayStation / PC-ENGINE). Re-live the strangest games from the 80's and 90's. Retro games were our youth! Still trying to translate all the posts from my old blog. Please see this post for more info. Also, please excuse any grammar and any other related errors you may find on this blog, as English is not my first language. Enjoy retro game life ! 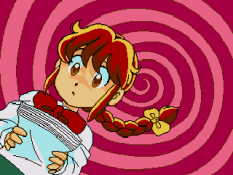 Beautiful graphics and superb voice acting make YUMIMI MIX one of the most interesting digital comics of the 16-bit CD-ROM generation. YUMIMI is a seemingly ordinary 15 year old girl who's currently enjoying the highs and lows of being a high school student alongside her childhood friends SHINICHI and SAKURAKO. At first her friend SAKURAKO, who's a fanatical realist, dismisses YUMIMI's tale about these objects as mere daydreaming nonsense. 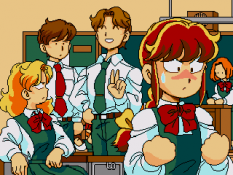 But SHINICHI - who's a member of the school newspaper club and is currently investigating a rumor going around the school about a ghost that sometimes appears in the gymnasium - agrees that there seems to be something strange going on lately and is quite excited about it. 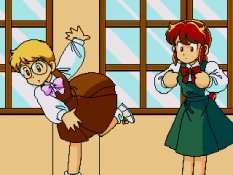 Later the same day YUMIMI has a fateful encounter with a strange student named RIE to whom she seems to be connected in a special way that's still not quite clear to her. She tells YUMMIMI about 「a big hole that will be opened in the gymnasium」. When the presence of the strange creatures at school becomes more than evident to the gang. They decide to sneak into the school gymnasium at night to investigate the hole that's supposed to be opening there. Could this be the beginning of an extra-dimensional monster invasion? 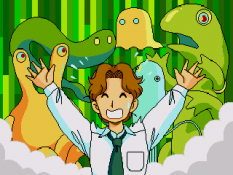 YUMIMI MIX is an 「interactive comic」 adventure game. 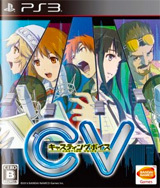 It was developed by GAME ARTS in conjunction with renown mangaka IZUMI TAKEMOTO. Both YUMIMI MIX and its spiritual sequel 「DAINA♥AIRAN」are considered classics in Japan. Gameplay-wise the game plays out like an interactive movie. As you watch the story unfold you often will be prompted to select an action from a pop-up command window. These action commands will let you decide YUMIMI's next action or response. Therefore the story will advance and change rapidly based on your actions. Because there's no possibility of a Game Over, and since you can save and load data from any command window, the game encourages players to experiment and create their very own adventure. The game features multiple story branches and multiple endings that will enhance the replay value of your adventure. Of course this is all pretty much standard interactive movie stuff. 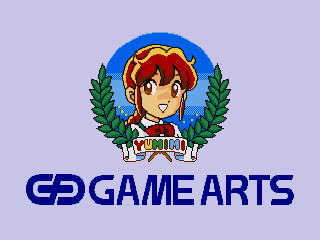 What really sets YUMIMI MIX apart from other similar games in the genre are its outstanding full-screen animated graphics that were created entirely using the MEGA-CD hardware. 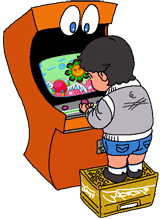 From my understanding GAME ARTS achieved this by making the artist IZUMI TAKEMOTO draw and paint the objects using only the tools from their specially developed graphic engine. This instead of just taking his drawings and adding them to the game separately. And while some the animation and backgrounds used in the game are not very detailed. 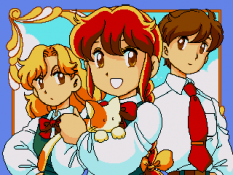 The sheer full-screen size of the graphics and the way the game flows seamlessly from one screen to the next make YUMIMI MIX one of the most impressive-looking adventure games of the 16-bit generation. Certainly more so than anything you could see on any other console at that point in time. 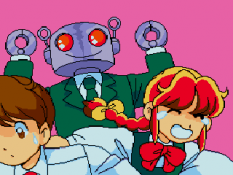 YUMIMI MIX is an engaging adventure game with a lovely cast of characters. However the game is certainly not for everyone. People who are not fond of shoujo anime/manga, or of romantic comedy youth TV anime dramas, might find the whole thing boring. Personally I think the story lacked a bit of ambition. The game is funny and charming from the start and it manages to stay like that until the credits roll, yet it never really goes beyond that. 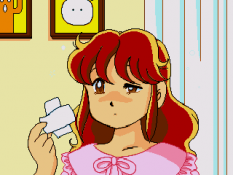 Playing YUMIMI MIX is like watching the debut episode of a TV anime series instead of a full fledged movie. Of course this doesn't sound bad at all, but I think GAME ARTS could have done better. 70's One-Hit-Wonder rockabilly band CAROL and their hit single 「FUNKY MONKEY BABY」from the OST of the film 「SUKEBAN : MANO-A-MANO」from 1974.